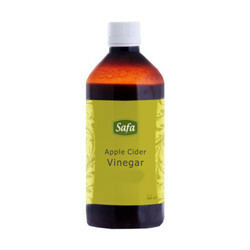 Safa Apple cider vinegar is raw, unfiltered and unpasteurised so retains all of the nutritional benefits of naturally occurring enzymes, beneficial bacteria, potassium and trace minerals. Only raw, unfiltered and unpasteurised Apple cider vinegar contains the 'mother' which resembles a cobweb-like formation that can be noticed floating in the bottle. The mother is a nutrition powerhouse, made up of living nutrients and beneficial bacteria. When Apple cider vinegar is filtered and pasteurised it uses heat which destroys the 'mother', all of the beneficial enzymes and many nutrients. Apple cider vinegar is a traditional food that has been used for centuries! The tangy-sweet combination of flavours makes it perfect for marinades and dressings. The vinegar is a pale yellow-brown colour and will contain a small amount of sediment - another sign that it is unfiltered and unpasteurised! Apple cider vinegar is often used as a salad dressing ingredient & in baking. It can also be made into a tea or combined with herbal tea. Mix 1 tablespoon of Apple cider vinegar with warm water or tea and enjoy! A squeeze of lemon is nice in this too. Apple cider vinegar is made from organic apples which are naturally fermented into cider, then into vinegar. This organic apple cider vinegar is aged in barrels producing a smooth apple cider taste. It is raw, unfiltered and unpasteurised so it contains the natural nutritional goodness of the apple cider vinegar 'mother'. Apple Cider Vinegar is made from organic apples which are naturally fermented into cider, then into vinegar. This organic apple cider vinegar is aged in barrels producing a smooth apple cider taste. It is raw, unfiltered and unpasteurized so it contains the natural nutritional goodness of the apple cider vinegar ‘mother’. The tangy-sweet combination of flavors makes it perfect for marinades and dressings. The vinegar is a pale yellow-brown color and will contain a small amount of sediment – another sign that it is unfiltered and unpasteurized. A traditional mix of Raw Honey with Apple cider Vinegar, Ginger, Garlic and Lemon. 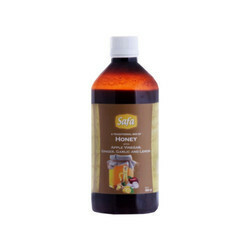 Used to help reduce Cholesterol, treatment of Heart and Stomach ailments associated with acidity and constipation, Obesity, Weight Loss and much more. 5 to 10 ml on empty stomach in the morning and half an hour before meals at night. Looking for Apple Cider Vinegar ?